At Guildford Animal Hospital we always offer proven, cutting-edge treatments for your pets. For this reason, all of our orthopedic surgeries are performed by a Board Certified Veterinary Surgeon…a veterinarian who has completed an additional 2-3 year surgical residency and is then certified by the American College of Veterinary Surgeons. By having a surgical specialist come to out hospital we can offer the most advanced surgical techniques at a more affordable price than sending you and your pet to a large specialty practice. We are proud that we have had clients travel to see us from as far as Vancouver Island and Alberta due to the level of care we provide. We offer many forms of orthopedic surgery including fracture repair, hip surgery, patellar surgery and cruciate surgery. By far, the most common orthopedic surgery performed at our hospital involves the treatment of the Cranial Cruciate Ligament Tear in dogs. To treat this a Board Certified Veterinary Surgeon will most commonly perform a TPLO (Tibial Plateau Leveling Osteotomy) which alters the geometry and biomechanics of the knee. This surgery is far superior to all other methods or treating a torn Cranial Cruciate Ligament in dogs in that it offers the fastest recovery time and the least complications. Although recovery involves post-operative restriction of activity for 8 weeks, we commonly see dogs wanting to use their surgical leg just a few hours after surgery! Here we provide all the information you could ever want about your dog’s TPLO Surgery. This is a huge amount of information so please ask to speak with one of our veterinarians if you have any questions about your pet’s condition or surgical recommendations. 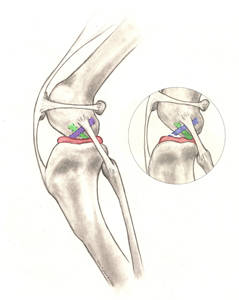 Illustration of the anatomy of the dog’s knee: Blue = cranial cruciate ligament; Red = meniscus; Green = caudal cruciate; the insert shows a ruptured cranial cruciate ligament (also note that the shinbone is displaced forward and is crushing the meniscus). 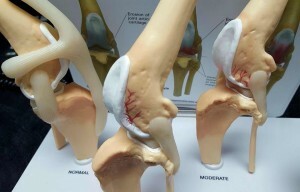 The meniscus is a ‘cartilage-like’ pad that sits in between the femur (thigh) and tibia (shin) bones. It serves many important purposes in the joint such as shock absorption, position-sensing, and load-bearing and can be damaged when the CrCL is ruptured. Diagnosing complete tears of the CrCL is easily accomplished by the veterinarians at Guildford Animal Hospital using a combination of your pet’s history, gait observations, physical examination findings and radiography (X-rays). By contrast, partial CrCL tears may be more challenging to diagnose. Sedation and pain medication will often be required to relax larger or tense dogs so that their knees can be manipulated and diagnostic quality X-rays can be performed with minimal discomfort or stress. Surgical treatment is typically the best treatment for CrCLD since it is the only way to permanently control the instability present in the knee joint. Surgery addresses one of the main issues associated with CrCLD — knee instability and the pain it causes as a consequence of the loss of normal CrCL structural support. The goal of the TPLO (Tibial Plateau Leveling Osteotomy) surgery is not to “repair” the CrCL itself. Due to biological and mechanical influences, the CrCL has no ability to heal once tearing begins regardless of the degree of severity. Unlike in human ACL surgery, the canine CrCL is not typically “replaced” with a graft. This fact is largely due to the major mechanical differences that exist between biped (human) and quadruped (canine) knees that make graft-based techniques less reliable in dogs. Stability of the knee joint is achieved without replacing the CrCL itself but rather by changing the biomechanics of the knee joint. This is accomplished by rotating the plateau (slope) of the shin bone. If present concurrently, meniscal injury will be addressed by your surgeon by removing the damaged meniscal parts when performing surgery to stabilize the knee. After your pet’s surgery at Guildford Animal Hospital you will receive detailed home care instructions. Postoperative care at home is critical. Premature, uncontrolled or excessive activities risk complete or partial failure of any surgical repair. Such failure may require extensive surgery to address. Proper postoperative care will be explained to you in detail by one of our veterinarians before and after surgery. Obesity in pets has numerous health issues associated with it that go beyond CrCLD. Weight loss should be considered critical to any overweight pet with CrCLD. At Guildford Animal Hospital we provide ongoing support with a free weight management assessment and program to ensure the best quality of life for your pets.